A Singapore-registered vehicle, a Land Rover, heading for Mersing is believed to have hit a road signboard at the Sungai Dohol bridge near Kota Tinggi and collided onto the oncoming Toyota Corolla. Both cars burst into flames upon collision. 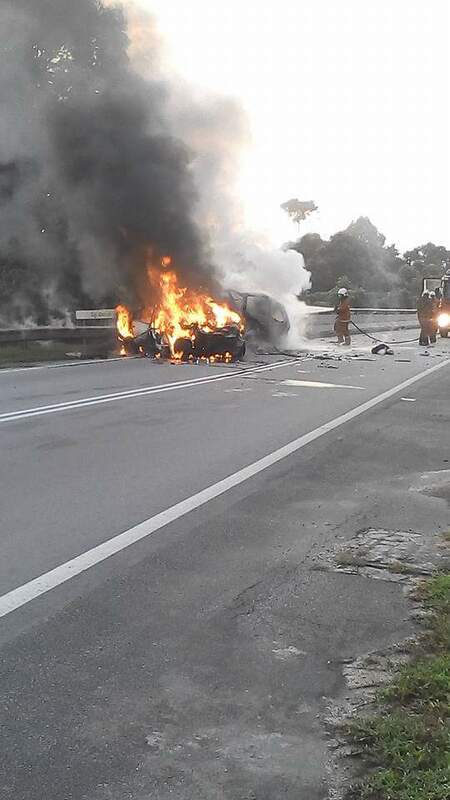 According to the Johor Fire and Rescue Department, four people burnt to death in the accident which happened early this morning at about 6.30 a.m. The burnt body of a woman was recovered from the Toyota Corolla; while the burnt bodies of a man, a woman and a child, all 3 believed to be Singaporeans, were found in the Singapore-registered car. 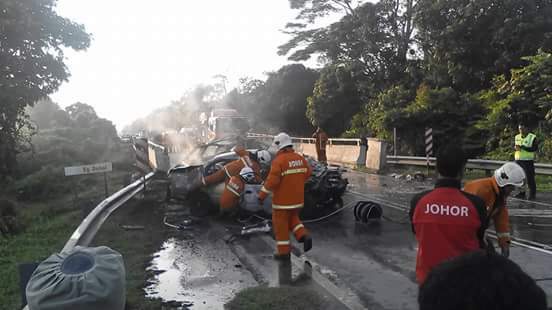 A witness to the accident and a resident of Kota Tinggi, Mr Yang Yu Hua reportedly said that when he drove past the site soon after the accident, he saw passengers from a Malaysian-registered car involved in the collision pulling a boy out of the wreckage. Mr Yang stopped to help and took the boy who looked physically unscathed to the Kota Tinggi Hospital. 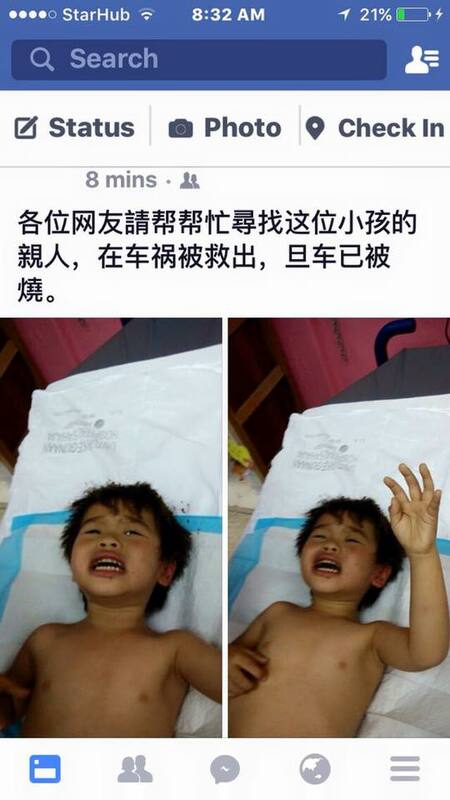 The boy appeared to be no more than 5-years old said Mr Yang. Meanwhile a Ms Hanni Wong has initiated a search on her Facebook for the next-of-kin of the boy. 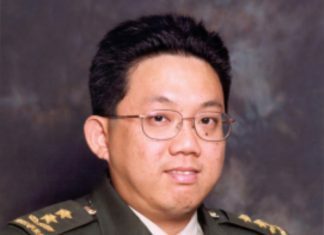 Please private message Ms Wong HERE if you have any information which may be useful. Singapore’s Ministry of Foreign Affairs have said that the Singapore Consulate-General in JB is in close contact with the local Malaysian authorities and that they “are in touch with the survivor’s next-of-kin, and are rendering the necessary assistance”. Further update: The boy’s next-of-kin arrived earlier at the hospital and the car crash survivor has now reportedly been discharged from the hospital.